I am Rumela, a Bengali, an Indian mom, who is a passionate cook and photographer, sharing my culinary journey in this page that I would like to call Mix and Stir. A Girl, a woman, who has a bucketful of dreams and passions, and one of such is food, food photography and food styling. Though I am not a professional photographer or cook but a self-taught who still has a long way to go, trying to improve every day and wish to learn more. We are originally from Calcutta, India but currently enjoying our days in San Diego, California. A beautiful place, where you can easily fall in love with nature, if you are a born romantic. When I came first time here, didn't believe a work place can be so scenic. It has got everything, starting from breath-taking canyon views to beaches, from flower fields on the roadside to safari park, Sea world and Lego land. My family abroad is a small one (for the time being !) with only three - me, my son Raunak and my husband. Raunak is 5 and half years old, a charming and bright kid who was helping me to name this page by giving many interesting options and sometimes by downloading cookbooks on Ipad. Even on his mother’s day journal, he would mention his mom’s blogging. My Husband, Shyama, a wonderful man who always teaches me to be self-sufficient and has given huge freedom (a woman can’t ask for anything more). I am very lucky to get him in my life. I grew up in a lovely family rather you can say in a foodie family, my mom and dad both are awesome cook. But me and my sister had no interest in cooking, rather we only loved to taste the food till we got married. Before coming to California, we spent some wonderful years in world’s two beautiful cities – Miami and Bangalore. 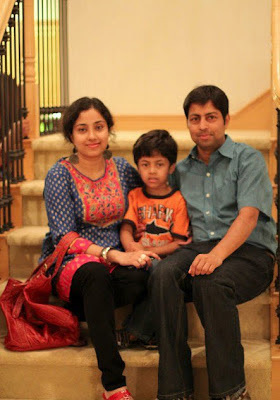 We consider Bangalore our second home where we started our married life and decorated our own first home. And Miami is the city when I moved to US first time and so I am still nostalgic of those exciting days. It’s been 10 years I am far away from my home town but these years have given me opportunity to meet people from different culture, festivals and their food habits. Slowly it gave me courage to walk down a new path in life and explore my interests in food and photography. Mix and Stir was born in January, 2013. Thanks to all my close friends who appreciated my recipes and food-photography for last couple of years and insisted me to start a food blog. I can’t thank them enough for inspiring me to keep my passion alive and making me realize that I can do more than what I could imagine. 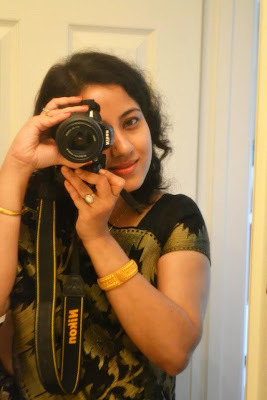 Cooking, writing, food styling and photography - It's a lot of work but still I'm loving it and a stress-buster for me. Oh yes, at the end, why I named this page Mix and Stir! Cooking is nothing but mixing the ingredients and stirring it properly till you get that yummy magic !! I had come up with three names and my husband picked this one. It did sound something unique to him. Your suggestions, thoughts and feedback are very important to me. Please leave your comments. Again I'm not an expert and still learning new things each day! Everything on this blog is copy right of Mix and Stir, so please don’t use any work without my permission.